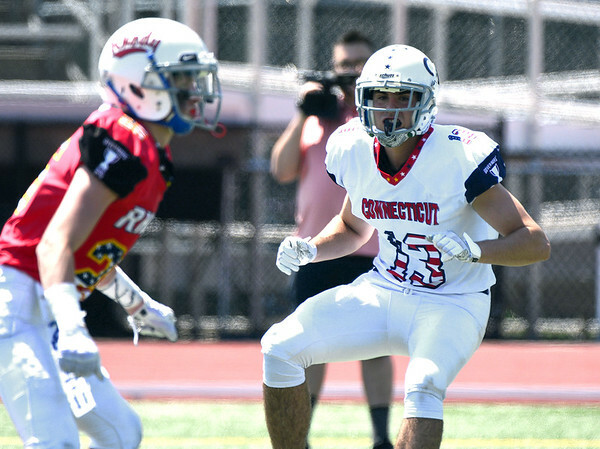 NEW BRITAIN - Some six months after they last suited up for their local high schools, several area players got one last chance to represent their communities in the revived Governor’s Cup senior all-star football game against Rhode Island on Saturday. Southington’s Joe Koczera, Ian Hall and Tim O’Shea were among those contributing to Connecticut’s 28-7 victory. O’Shea, a Wagner College commit, was the most impressive of those local players. The wide receiver found openings in the Rhode Island defense all game and recorded three catches and a touchdown. He was pleased with the event, which hadn’t been held since 2012. Bristol had only one player in the game: Gabe Updegraff, an offensive lineman from Bristol Central. Updegraff was a standout on the Rams’ line this past season, which led to Dathan Hickey tearing up the turf as a running quarterback all fall. The Western New England commit was excited to be part of the game and he received a good amount of playing time. Finally, there were a pair of head coaches from the area on the staff. Mike Drury from Southington and Tim Shea from Plainville both served as assistants on the Connecticut staff. The game reminded Shea of his playing career growing up. Posted in New Britain Herald, Plainville, Southington on Sunday, 1 July 2018 21:19. Updated: Sunday, 1 July 2018 21:22.